Get bigger biceps, broad shoulders, a bigger bench press, powerful legs, cut abs . . .
without ever leaving your home! The body you want, in the space you have. The strength you want, with the equipment you have. The muscles you want, in the time you have. You don't need to join a gym to get in shape. In fact, for a lot of guys, the gym is an impediment to getting in shape. The crowds, the inconvenience, the intimidation, the time, the commute-- by the time you add it all up, you could end up investing 2 hours to get 45 minutes of exercise. No matter how little space you have, no matter how little equipment you have, no matter how little time you have, you can get the results you want without stepping inside a gym. With beginner, intermediate, and advanced full-body workouts for each type of equipment, The Men's Health Home Workout Bible gives you more than 400 exercises altogether, photographed and fully described. From pushups to power cleans, from crunches to jump squats, we show you how to get more muscle and strength at home, whether you're a complete beginner or a competitive athlete. 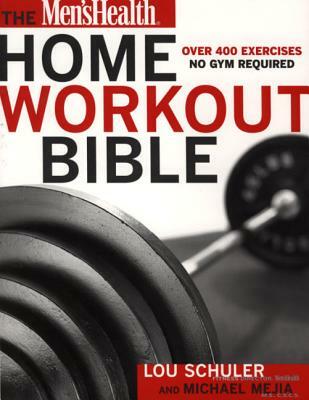 The Men's Health Home Workout Bible is a personal trainer, on call 24 hours a day, 7 days a week. Lou Schuler and Michael Mejia, M.S., C.S.C.S., are coauthors of the book The Testosterone Advantage Plan(TM). Lou is also fitness director for Men's Health, the world's largest men's magazine.